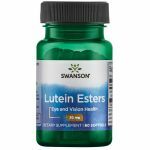 Now you can successfully fight back the devastating free-radicals attack with Swanson Lutein. This potent natural carotenoid provides specific antioxidant support for the macula and the remaining delicate eye tissues. Studies also reveal that the intake of 6 to 10 mg of lutein per day acts as antioxidant for the skin increasing skin resistance to the damaging oxidation processes. Other ingredients: Sunflower oil, gelatin, glycerin, yellow beeswax, purified water, natural tocopherols. What’s your B.L.U.E? Is your computer destroying your eyes? • A terrific support to your eyes at an affordable price. • Promotes cellular integrity of the eyes. • Protects eye tissues from the free radicals’ damaging effect. 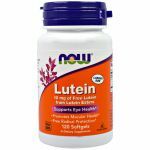 Lutein is the best eye helper!